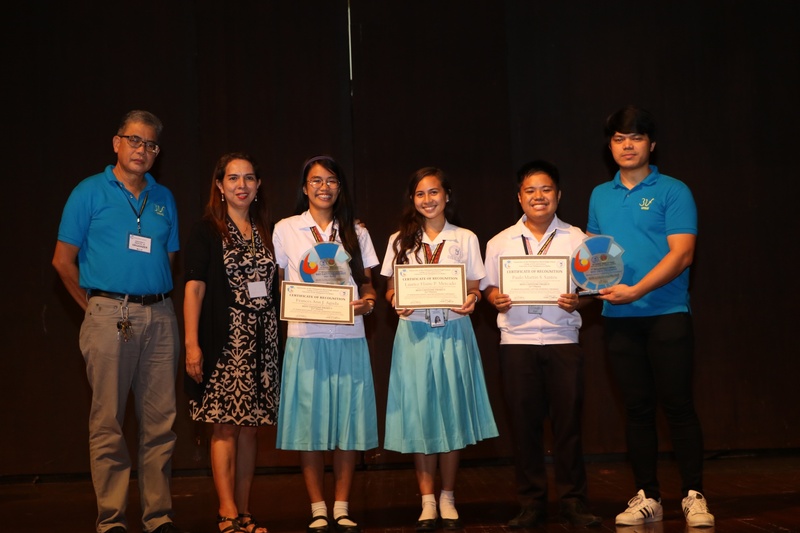 The quest to use agricultural waste to remove a harmful element from wastewater earned for three UP Rural High School (UPRHS) students the coveted top prize at the 2nd Senior High School (SHS) Capstone Experience Conference. Frances Ann Aguda, Laurice Elaine Mercado, and Paulo Martin Santos bagged the Best Capstone Project for their research on reducing chromium in laboratory wastewater using rice husks and banana peel. Chromium is an element that can be toxic at high concentrations. They were also hailed as Best Oral Presenters for the Materials Science, Engineering, and Prototyping field of the conference that was held on Apr. 13 at the DL Umali Hall and the Physical Sciences Building in UPLB. The triumph of Aguda, Mercado, and Santos are two of 13 that UPRHS claimed in the SHS Capstone Experience Conference, which awarded 16 entries out of a total of 80 SHS capstone projects. “Ruralites” also won the two runner-up places in the Best Capstone Project, the five top and four runners-up places in the Best Oral Presenters category, and the Best Poster Presenter prize. The conference covered five disciplines: Materials Science, Engineering, and Prototyping; Agriculture and Food Sciences; Biological and Physical Sciences; Business Studies; and Humanities and Social Sciences. Students from South Hill School, Inc., placed second in the Best Oral Presenter in Business Studies and third in the Best Poster Presenter categories; while the University of Santo Tomas Senior High School bagged the second prize in the Best Poster Presenter. “The conference has been designed to provide an innovative and comprehensive overview of the latest research developments in science and related fields,” said Assoc. Prof. Lea Garcia, officer-in-charge of UPRHS, the organizing school. Reading from the message of Chancellor Sanchez, Dr. Jamias said, “our country needs people who will be part of finding sound and sustainable solutions that can address the challenges of climate change, environmental management, the development of affordable and clean energy, and food and nutrition security.”. The conference also featured talks from Dr. Melvin Carlos, deputy executive director of the Philippine Council for Agriculture, Aquatic, and Natural Resources Research and Development, and Dr. Percival Almoro, professor at the UP Diliman National Institute of Physics.